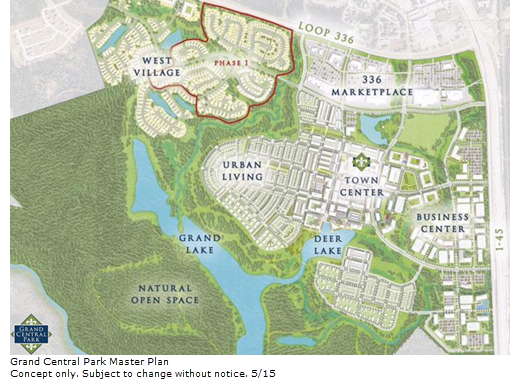 ​​ CONROE – The retail and restaurant development within the master-planned community of Grand Central Park, on the Boy Scouts’ former Camp Strake land north of Houston, has announced its first tenants. Known as 336 Marketplace, the mixed-use retail center will include a 125,000-sf Kroger Signature store, a 42,000-sf HomeGoods, a 25,000-sf Ross and a 21,000-sf Michaels. The regional shopping center will feature 700,000 sf of retail and restaurant space within the northeastern portion of Grand Central Park. 336 Marketplace will be along the south side of Conroe’s Loop 336 near the west side of I-45. The Kroger is expected to open in early 2018, while the other three stores will open during first quarter 2018. Check out Houston Retail Market Research.